RpiDATV is a software running on raspberry pi micro computer written by Evariste F5OEO (mail twitter). It encodes video and compute the QPSK baseband modulation. Latest version is now hosted on github. All instructions to build is there. Before that, complete SD image could be downloaded but size of download files is huge (1.2GBytes). Updates of image are also hard to maintain. In future, only some released versions could be built based on github sources. You can look at HamRadio Presentation made at HamRadio 2015. 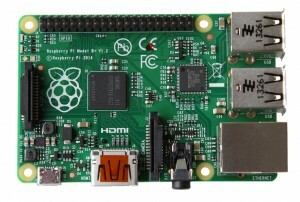 RF could be transmitted without any other hardware through a pin of the Raspberry pi header. It is mainly a test mode as QPSK spectrum is not filtered. By using harmonics it could be received directly by a set top box on L band. I/Q modulation is provided out of 2 pins of the GPIO header. Hardware I/Q modulator is needed : RBTVMOD, DigiLite, DigiThin , F4DAY, F1FAU , F1DOJ, old broadcast modulators. Send IP Transport stream to datv express : Datv Express Server (G4GUO). This output the transport stream to an external modulator. Using this method, it is possible to upgrade an all-in-one encoder/modulator from MPEG-2 to H264. This page was last modified on 9 January 2019, at 09:46.